Dribbble is an online community and a social network for designers, aimed to answer the question “What are you working on?” Every day designers worldwide post screenshots of current projects and gather feedback. Dribbble also lets members organize meetups under its name. Countries including Spain, India, France, Netherlands, Turkey, USA, China, Poland, Indonesia, Croatia, Egypt, United Kingdom have hosted Dribbble gatherings over the last 5 years. Meetups bring together more than 10 000 participants annually. Noosphere has begun supporting the global movement and provided an opportunity for Ukrainian designers to discuss the latest trends, share experience, find inspiration and network locally. More than 150 designers joined Dribbble Meetup@Noosphere. They represented not only Dnipro, but also the cities of Kyiv, Odessa, Vinnytsia, Lviv, Cherkassy and Tel Aviv. So many people wanted to attend the meetup that the venue was over capacity, forcing the creation of a wait list. If a registered participant dropped out of the event, a participant from the wait list was added. Anyone who couldn’t attend the event was able to participate via online streaming. 391 viewers remotely from around the region. The Meetup schedule included 9 speeches from prominent Ukrainian designers. 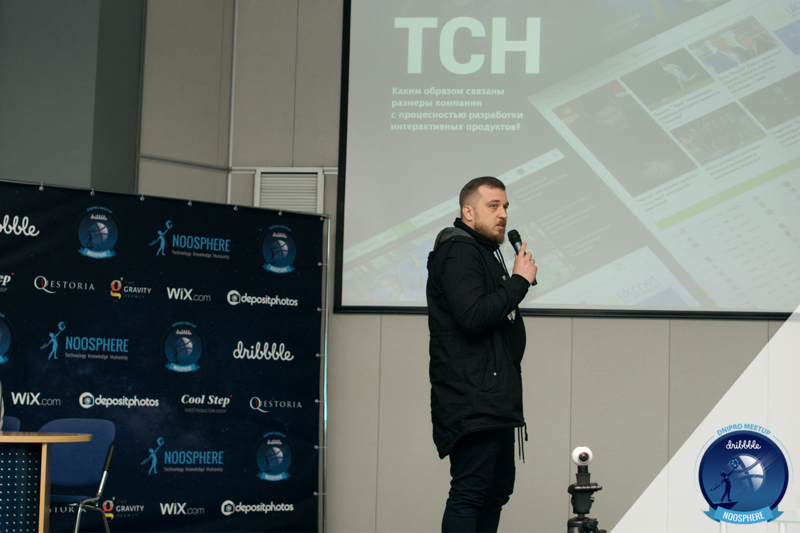 The speakers were from 1+1 Media, Tubik Studio, Chapps, Wix.com, Gagarin IT School, Fedorov Studio, “CoolStep”, “Sound Works”, as well as some well-known freelance designers. The audience was entertained not only by useful and informative speeches, but also by contests, organized by Noosphere. There were two competitions: the cinematography competition and the Dribbble Analog Playoff Battle. Cinematography is a “live” photo, one part of it is static and the other is moving. 8 cinemagraphs participated in this contest, and the audience chose the winners. The meetup program also included a drawing with door prizes from meetup partners, DepositPhotos and The Gravity Agency.